Sinamak is but one of a number of Spiced Vinegar concoctions produced in the Philippines. In the province where it comes from, it is practically a permanent dinner table fixture in many households. And it is not uncommon to see a bottle gracing the tables of most local restaurants, together with its perfect partner, a bottle of Soy Sauce. Traditionally, Sinamak is made up of predominantly Bird’s Eye and Thai chilies, in alternating green and red layers. Thrown in the mix are some cloves of garlic and a lot of slivers of Langkauas or Galangal, (also known as Thai Ginger). The Philippine version uses the vinegar made from fermented coconut palm water or sap - a vinegar used extensively in Southeast Asian cuisine. Our version of Sinamak departs from the traditional and uses a combination of 5-10 different types of freshly-picked chilies and peppers - depending on availability - including the Bird's Eye and Thai chilies. It is topped with plain white cane spirit vinegar. 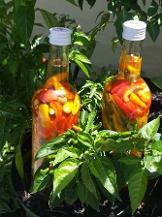 As much as possible the chilies are bottled on the day they are picked or obtained - to ensure absolute freshness. No artificial flavoring or preservative is used. And our chilies are sourced from either organic farmers or pesticide-free farms. One can taste the burst of freshness with every drop! Left standing after a week or so, the resulting concoction then develops an amazing complex flavours, so taste-enhancing that, when added to dishes during cooking, or upon serving, enchants even the most jaded of palates. An amazing bonus is the health benefits of this product. Please check out the health benefits of the fresh ingredients used. Sinamak is so versatile it can be added to enhance the flavour of just about anything. But Sinamak shines best with curries, stews and stir fries. 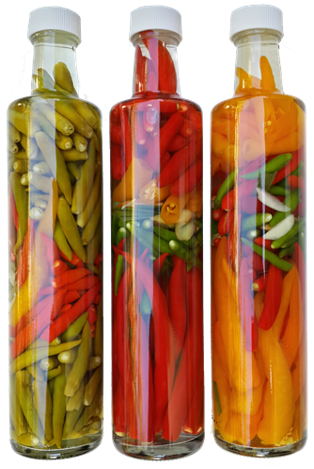 Generally, use only the vinegar for cooking, for making sauces and marinades. 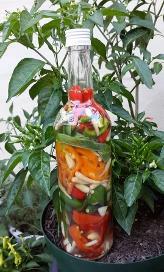 But the Sinamak chilies can also be used for an extra flavour punch. It can be added to any type of meat or vegetable dishes and even fruit or pudding that calls for acidity and a bit of heat. 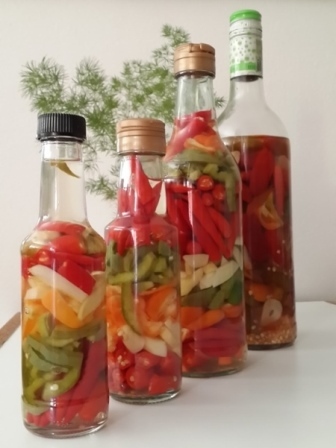 Always top up with plain white vinegar to keep the chilies covered. You may or may not refrigerate. The vinegar is a natural preservative. 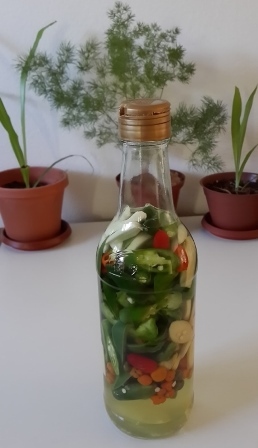 The bottle can last for years or until only the seeds and the chili skins are left at the bottom. Typically, Sinamak is usable for as long as you can still extract heat and flavour from the chilies and the other spices in the mix. For more information regarding usage of Sinamak, please check out the Frequently Asked Question Page. See our Recipe Page for some great tasting dishes you can use Sinamak in.